Our approach to youth empowerment is to teach students the skills they need to do the projects and activities that get their message across. 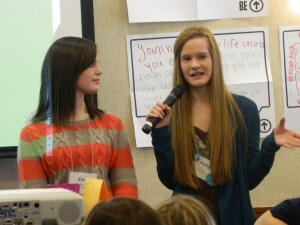 One of the most critical skills for youth advocates is public speaking and presenting. These skills are used in providing educational presentations, giving a press conference, performing a skit, recording a radio PSA, or providing testimony at a legislative hearing. Presentation Skills is a highly interactive workshop taught by the students of Dover Youth to Youth. It is generally provided to communities that are trying to develop the capacity of their youth advocates and Dover Youth to Youth uses these techniques constantly to develop the skills of our members as well. In this training, we teach presentation skills by focusing on 4 core skill areas: Speed control, volume control, animation of voice, and animation of body. We have found that improving these 4 areas can improve anyone’s ability and confidence as a speaker. Students are taught to identify common errors in presentations and how to coach one another to improve their presentations in these areas. The training is a combination of an interactive classroom presentation covering the principles and explaining vocal techniques – combined with simple, fun exercises and applied practice conducted in break out groups. This training can be kept more general or it can be designed to emphasize one type of presentation over another, depending if the attendees are going to be teaching an audience or classroom (instructional), advocating in the public eye (informational-persuasive), or presenting skits/Public Service Announcements (theatrical). This lesson can be taught to youth audiences or can be taught to adults who wish to do this kind of work with youth. The workshop can be done as a 45 minute presentation where audience members are selected to demonstrate the 4 skill areas that the student presenters emphasize. However, it is more effective as a two-hour workshop where attendees have the opportunity to break up into groups to practice the skills discussed in the presentation, using samples of media created by Dover Youth to Youth. 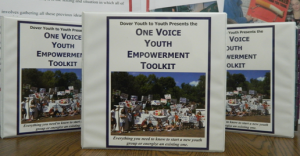 To request a presentation of Presentation Skills for Youth Advocates by Dover Youth to Youth go to How to Schedule Us in the Resources section of this web site.